Thomas Steen was born in Grums, Sweden, selected to the World Junior all-star team in 1979 he was drafted that same year in the fifth round by the Winnipeg Jets. He joined the NHL Jets during the 1981-82 season and scored his first goal on October 23, 1981 against netminder Tony Esposito as Winnipeg and Chicago batled to a 5-5 tie. In the 1984-85 season he scored a career high 30 goals combined with 54 assists for 84 points. 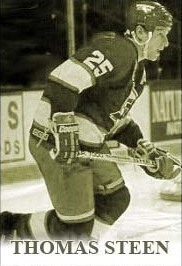 His best season with the Jets came in 1989-90 when he accumulated 27 goals and 61 assists for a total of 88 points. Steen played his entire 14-year NHL career (950 GP) with the Winnipeg Jets and led the club with most career assists with 553 and finished with 264 goals and 817 points. His number 25 jersey was retired by the Winnipeg Jets alongside Bobby Hull's number 9.